I made this dinosaur cake for my twin daughters’ 3rd birthday, they love dinosaurs at the moment – so I had to come up with something appropriate! The cake was a chocolate mud cake packet mix. I used a deep 9 inch round tin (for the head) and two muffin holes in a muffin pan (for the eyes). When the cake was cooled I cut the shape from a template. The cake was then frosted with butter cream frosting and decorated with red snakes, smarties, marshmallows and ice-cream wafers with sprinkles. 4oz butter beat together with 1 1/2 cups icing sugar (powdered sugar), 2tbs milk and pink food colouring. Needless to say it was a real hit, but I think I had just as much fun making the cake! 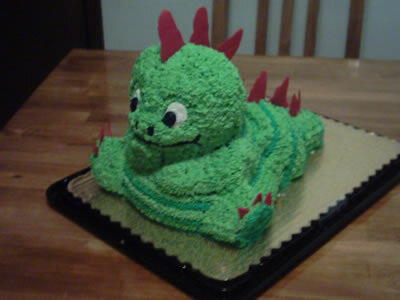 This is the dragon / dinosaur cake that I made for a friends’ daughter’s birthday. To make the body, I used the Wilton Teddy Bear pan. 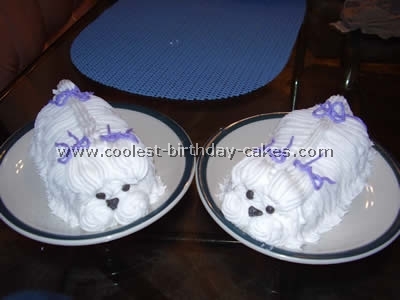 I cut the ears off of the cake after it baked and then I used the Wilton wonder mold for the tail. I cut the cake from the wonder mold in half long ways and stuck it upside down to the back of the bear with butter cream frosting. Then I continued using pieces from the rest of the wonder mold cake to form the tail. It’s best if you use white cake in these molds because they come out better and even better if you reduce the amount of oil in your cake to one tablespoon instead of however much it says on the box! Beat the butter and the shortening together first, then the vanilla, and gradually add in the sugar until thick. It will seem dry until you put just the right amount of milk in, but do that gradually too, because you want it to keep its stiffness. Color most of your frosting green, but make sure to save a little white for the eyes and then just heap the frosting into a disposable icing bag with the large star tip and go to town. The stripes are optional! I recommend doing the mouth and nostrils with your black frosting first because they are easier to frost around. When you’re all done with the body and the face, THEN you put the eyes on. You just put a little white frosting on where the eyes go and get your finger wet with water and smooth it out; I used black frosting from the store bought tube for the middles of the eyes. For the spikes, I melted some vanilla candy melts (you can use any color) and used a spoon to put the melted candy on wax paper in a triangle shape. When they cool they harden (you can speed up cooling by sticking them in the freezer for a few minutes) then you have to sort of push them into the cake, and make sure they’re not too thick, because the weight will pull them off of the cake. It really is easier than it looks; it just takes time and patience. This pan was a Wilton dinosaur cake pan and a long loaf pan as the road and mini loaf pans were cut to buildings. The dinosaur is covered in stars and his back is cardboard triangles covered black. I also outlined it in grey. The pole is also cardboard. The buildings are painted with colored frosting and dots made the windows. Flames were added and colored yellow and red. The road has cracks added and I also added a car later to go in a crack for the broken road. This dinosaur cake served about 40 people. I baked one large round (in the largest round spring form pan) and one square. (I used 2 cake mixes.) Take the round and cut it in half and stand up the cake on the cut edges. I used bamboo skewers to hold the cakes together so they would stay standing. Take the square and cut it in half, then cut one of the halves in half on the diagonal/triangle. Place one each for the head and tail. Take the remaining half of the square and make 4 legs. I iced the cake with chocolate icing. For the plates and spikes, I used chocolate covered graham cookies and cut them to shape. The dinosaur cake was an absolute hit!!! 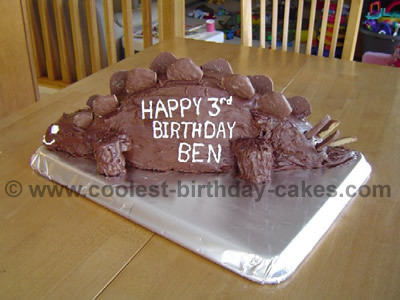 For my son’s 4th birthday, he requested a dinosaur cake since he loves dinosaurs. 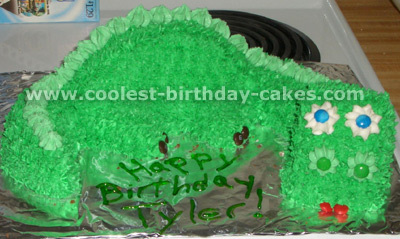 As soon as I saw this dinosaur cake idea on the Web, I had to try it. A couple days in advance I tinted fondant 2 different shades of purple and cut them into triangles of different sizes (for the spikes on the back.) Allow them to dry and harden. 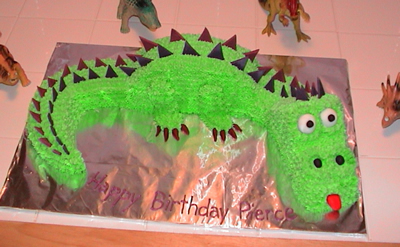 This dinosaur cake is made from two regular 9 inch round pans. After the cakes are cooled, cut the first one in half. Stick them together with frosting, flat sides lined up. This part will become the body of the dinosaur. On the second cake, you will need to cut it into thirds, crescent shaped. One piece will become the tail, the second the neck, and the third (cut this in half, and stand on end) will become the head. 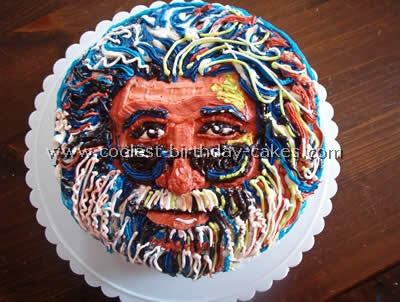 You will need to use extra frosting to pipe in the legs, eye ridges, and nostrils. Finally, I used fondant to form the eyes, tongue and toe nails, and added the purple spikes at the end. 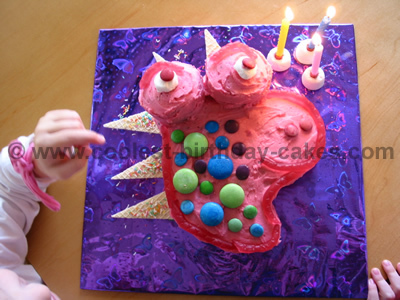 This same dinosaur cake idea can be used to make a dragon, just add teeth instead of a tongue and fire out of the mouth. My son loves dinosaurs and so he wanted a dinosaur cake. 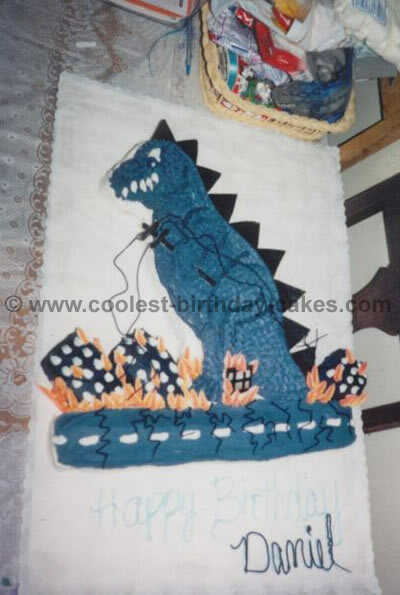 I did some research on the internet and found the idea for this cake. It is your basic cake mix. I used two 8″ round pans (you can use bigger if you need to feed more people). 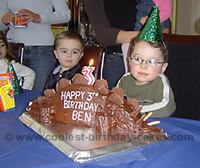 It was actually my first 3D cake I ever made. It turned better than I thought it was going to. My son loved it.